Want to find a good pre-k or kindergarten program for your child? On October 5, 2017, Clara Hemphill, founder of InsideSchools and author of New York City’s Best Public Pre-K and Elementary Schools will lead a discussion about some of New York City's best public pre-kindergarten programs and elementary schools. She'll highlight some undiscovered gems--schools you may not have heard of or considered -- and walk you through the pre-kindergarten and kindergarten application process. The 1-hour presentation, followed by a Q and A session, will be held at the New School on Thursday, Oct. 5 from 9:30-11:30 am. Children are welcome! The event is free but you must RSVP. 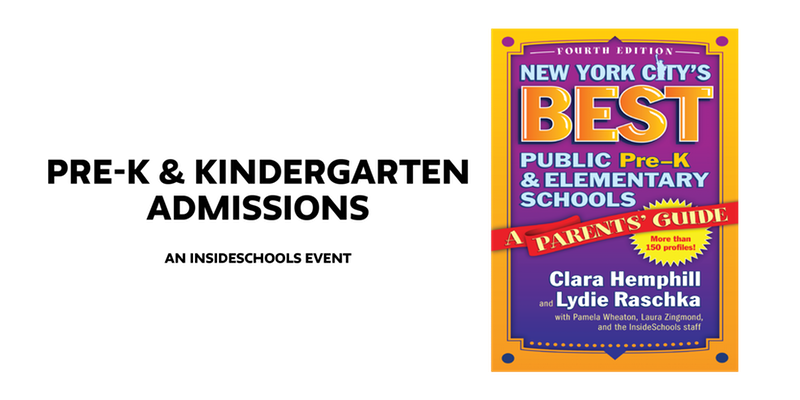 A $20 ticket includes a copy of our book: New York City’s Best Public Pre-K and Elementary Schools, 4th Edition. This guide, based on our visits to more than 150 schools in all five boroughs, has critical information on "who gets in," the quality of teaching, dual language programs, special education services--and more. This special offer is a 30 percent discount off the list price of $29.95. RSVP on EventBrite here. InsideSchools is proud to partner with Bowery Babes to offer this workshop. Bowery Babes is a 3,000+ member downtown NYC nonprofit mothers group dedicated to supporting women from pregnancy through the early years of motherhood and beyond.